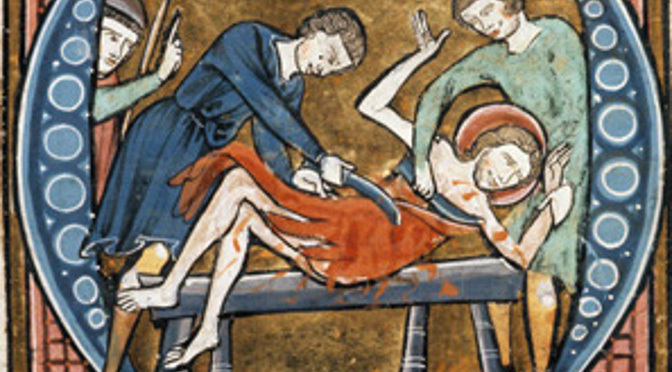 Medieval pictures which depict flaying or flayed people are usually full of draped fabric, suggesting an association between skin and clothing so common as to be very easily evoked. 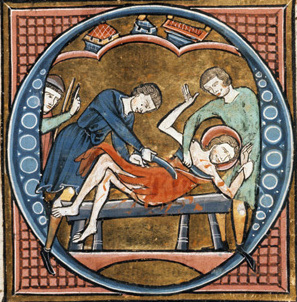 Sarah Kay (JMEMS, 2006) has investigated the changing representation of St Bartholomew (who was martyred by being skinned alive), which suggests that the association between clothing and skin was central to his medieval but not his later manifestations. In the Early Modern period St Bartholomew became an échorché, carrying his own skin as in this mid-sixteenth-century Italian sculpture. 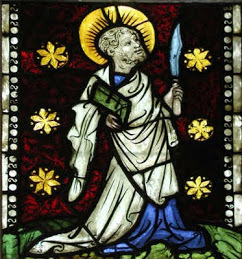 In contrast, in medieval iconography, whilst he regularly carries his symbol – a flaying knife – and sometimes also his own skin, he is usually depicted before his flaying, with his skin still intact and dressed in heavily draped clothing. 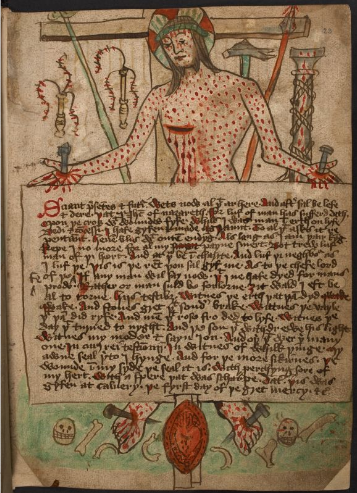 In some other medieval depictions his bloodied skin is made to look like worn clothing, as in this illumination from a thirteenth-century book of French saints’ lives. St Bartholomew’s clothes, and then his skin, came off in the sixteenth century. 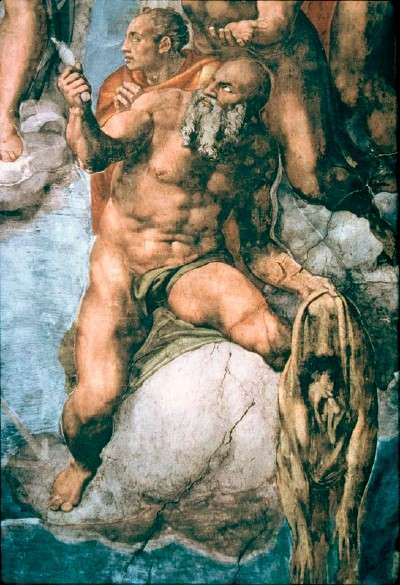 Michelangelo’s famous depiction of the saint in his Last Judgement fresco in the Sistine Chapel represents a ‘half way house’ in which the saint wears no clothes (the drape of fabric he now wears was added later on the orders of the Council of Trent) but simultaneously carries and wears his own skin. With the Early Modern divestment of St Bartholomew goes the ready substitution of skin and clothing. 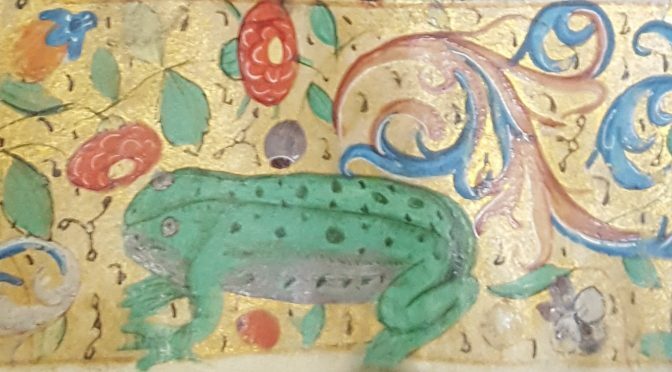 People’s proximity to industrial processes no doubt forged this earlier connectivity; there was a reflex understanding of the ‘before’ and ‘after’ states of animal products which made them into substitutes in medieval art and literature. 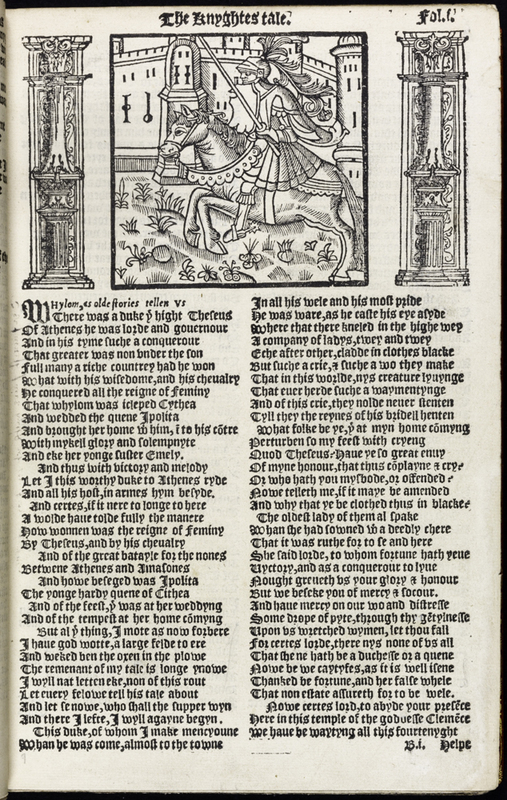 ‘I wolde be clad in Cristes skyn’, wrote an anonymous medieval lyric-writer: gruesome clothes indeed. Yet, as Sarah Kay reminds us, Bartholomew is the patron saint of parchment makers as well as leather workers, and a similar proximity between skin and parchment offered another set of prefabricated metaphors for medieval poets. 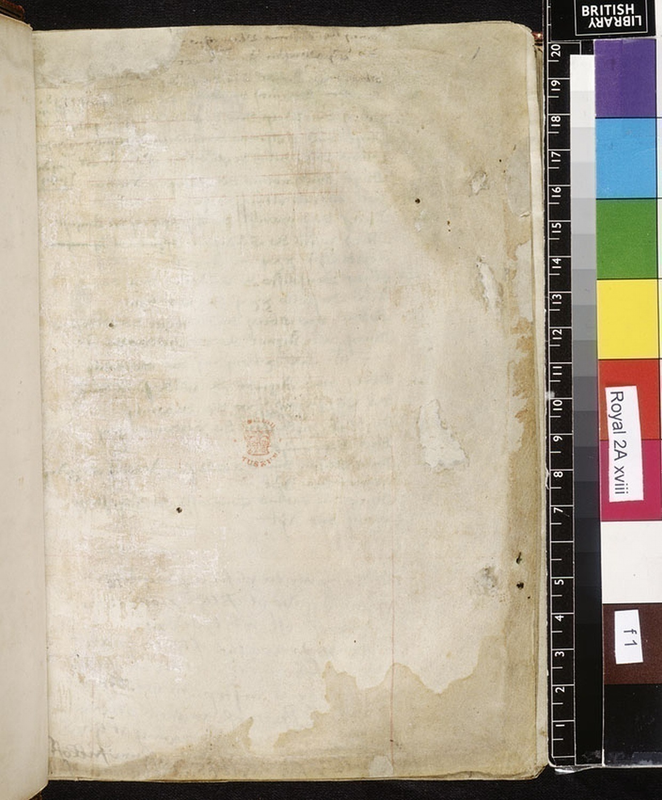 The so-called ‘Charters of Christ’, a set of related late-medieval poems in which Christ makes a charter with mankind, are at the centre of a tradition of affective poetry which exploit the relationship between skin and parchment for Eucharistic meditation. 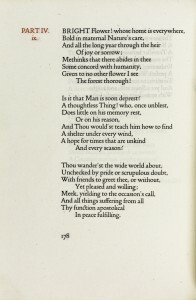 In the long version of these poems, Christ (who is understood in scriptural metaphor as a kind of sheep, the lamb of God or agnus dei), having no parchment on which to write his charter, writes it on his own skin, using one of the instruments of his passion as a stylus. The ink is sometimes made of his blood and sometimes, anti-Semitically, of Jews’ spit; the charter is sealed with wax made from his heart. 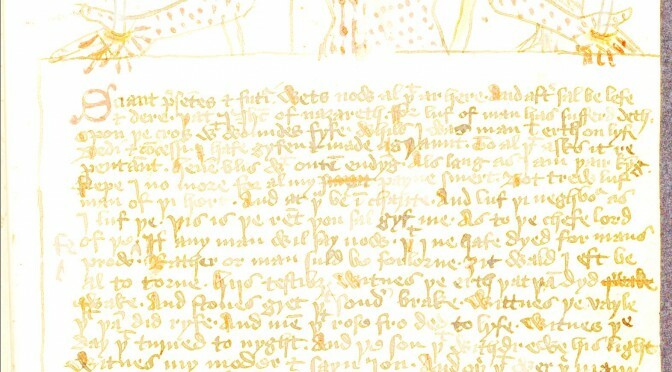 The description of the crucifixion itself – Christ’s scourging, stretching and drying – is also a recipe for making parchment and deploys the trade vocabulary of the parchmentiers. 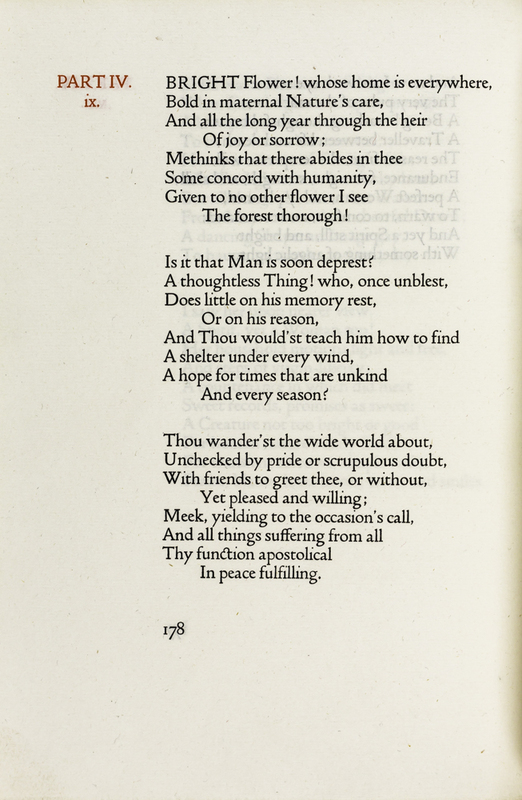 This long version of the poem survives in fourteen manuscripts, however its analogies were well enough known by readers of other medieval texts, that they could be fairly lightly referred to and yet the whole tradition evoked. 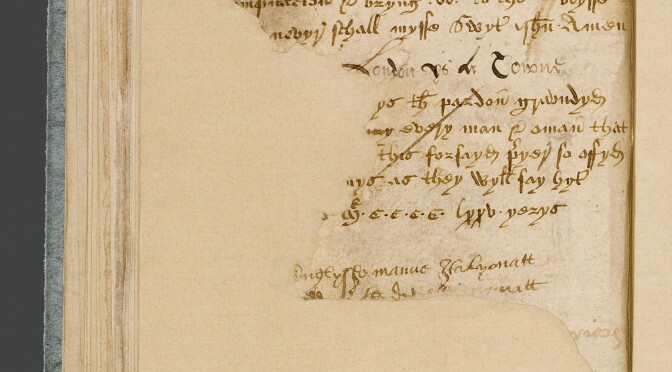 So, for example, in the Short Charters the words of the charter are typically presented without the contextualizing narrative about Christ’s bodily substitutions for writing materials and yet the images which sometimes accompany them visually cite them. This is true, for example, in the York Pinners’ Play, the part of the York cycle drama which depicts the crucifixion. In that play the soldiers who crucify Christ are depicted as labourers and the crucifixion is part of their everyday work, which they go about with little grace and much complaint about its arduousness. In their grumbling banter they place a special emphasis upon the effort of stretching Christ: ‘tugge’ and ‘[l]ugge’ they urge each other. Pinners, of course, made nails (‘nayles large and lange’, is how they are advertised in the play) and, although in the drama they are used to crucify, in medieval industry they were more typically used, amongst other things, for fastening skins to tenters (special stretching frames) to make cloth and parchment. When, late on the play, Christ finally speaks he does so in terms which are reminiscent of the parchment-Christs of the Charters, citing the same Biblical text (Lamentations 1.12) which also features prominently in the Charter poems. Like the Charter Christs, Christ in the Pinners’ Play asks for the audience’s attention: ‘take tent’, he commands. The Middle English word ‘tent’ is an aphetic form of ‘attent’, a cognate of modern English ‘attention’ and ‘attend’. Whereas modern English has forgotten the mechanical image in these words, medieval people would have associated them with the idea of stretching (the word comes from Latin adtendere, to stretch) and, like ‘nayles’, ‘tent’ would have been a common word in the pinners’ trade lexicon. Thus Christ asks the play-goers for their stretched attention; he asks them to imitate him, stretched out like parchment to dry on a frame. 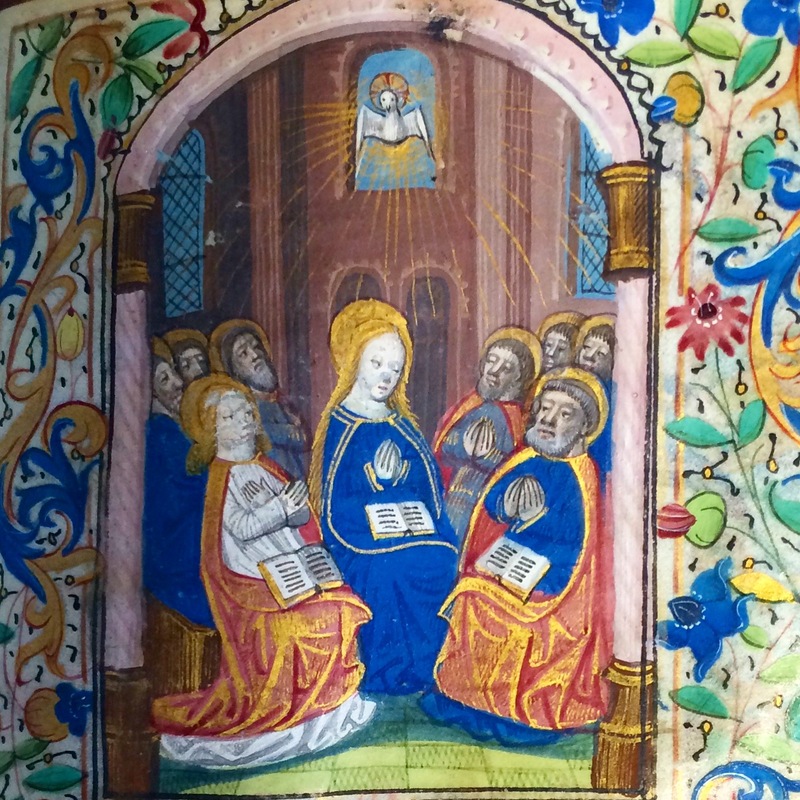 When one starts to look, the imagery of stretched parchment occurs regularly in Eucharistic contexts. 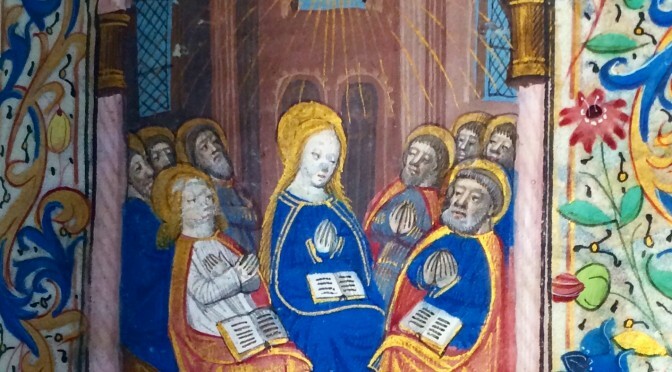 A weird little late-medieval story, that turns up in a number of places and is embedded for instance in a poem which explains ‘How to Hear Mass’, describes the way that the devil eavesdrops on, and writes down the chit-chat of women in church. He writes so much that he runs out of parchment and, whilst trying to stretch it further, snaps it, causing his head to smash into a pillar. Whilst lots of critics have discussed the way in which the story warns women against speaking in church, deploying a standard misogynist trope which is regularly seen elsewhere, for me, if this is all this story were, it oddly doesn’t work in the way that one might expect. The women aren’t punished; indeed, because they talk a lot the devil is more injured. St Augustine, who is giving the sermon in the story, and Pope Gregory, who has commissioned it, laugh to see the devil so confounded. 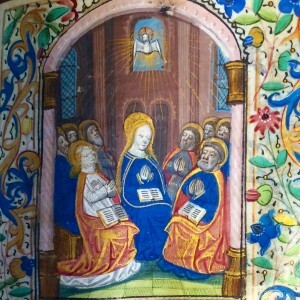 The story is already set during the Mass and this, along with a medieval reader’s recognition of parchment as a figure for the body of Christ, suggests an allegorical reading, which is not often how it is treated in the modern critical literature. 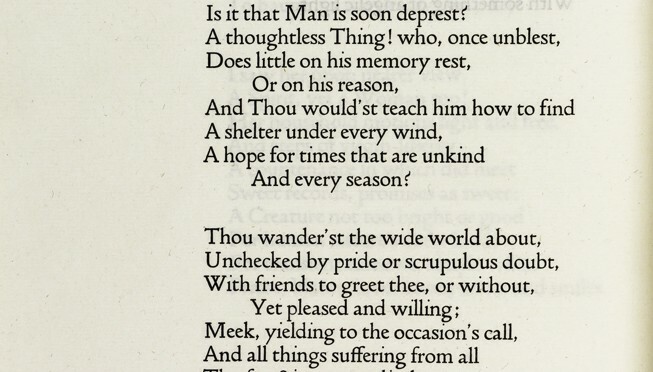 In another example, when Thomas Hoccleve complains about the sufferings of writers, that their work is laborious ‘elengere’, that they must endure (‘dryen’) eye-strain, when they pore over the ‘shepes-skyn’, it is hard not to recall the metaphorical fields that I have limned out above. 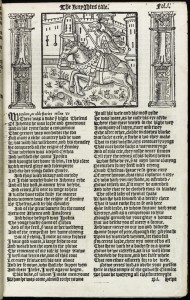 Hoccleve implies, without fully saying, that he has ‘taken tent’ of Christ’s commands and imitates his suffering in the physical act of writing. 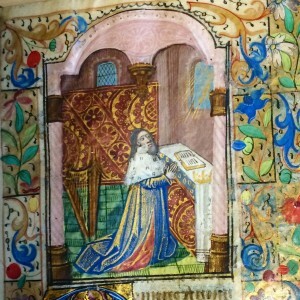 Hoccleve tells us, in another piece of his life-writing, that he once borrowed a book with which he intimately identified, which seemed to describe the very workings of his being but, then, before he had finished or properly remembered it, had to return it. It is appropriate that this patchily read and remembered book is the model for his account of his erstwhile madness, in which (as he says): ‘the substance of my memorie / wente to pleye as for a certain space’. 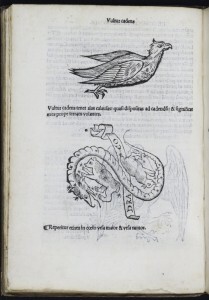 Books cover Hoccleve in a surprisingly material way: so that his absences and presences of mind depend on the vagaries of the physical circulation of particular manuscript books. The material nature of parchment, then, was crucial for the way that medieval people read and wrote. 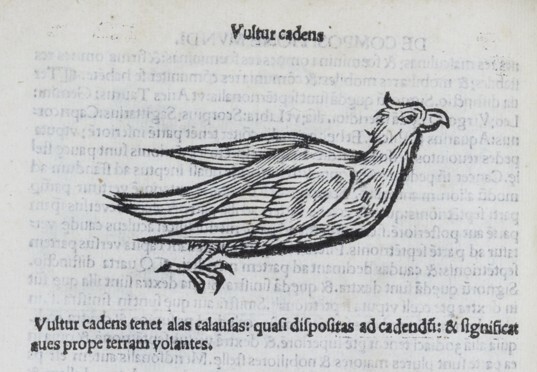 Its animal nature meant that it was already metaphorical, even before it was written on. We might ask, because these Christological associations are so ubiquitous, whether medieval people could ever read, or write on parchment without them in mind. Today we are used to thinking about text in a somewhat unlocated way: we might read a text in this edition or in that one, electronically or in hard-copy; for medieval readers, however, the text was much more ‘locked down’ to particular pages, in particular books. 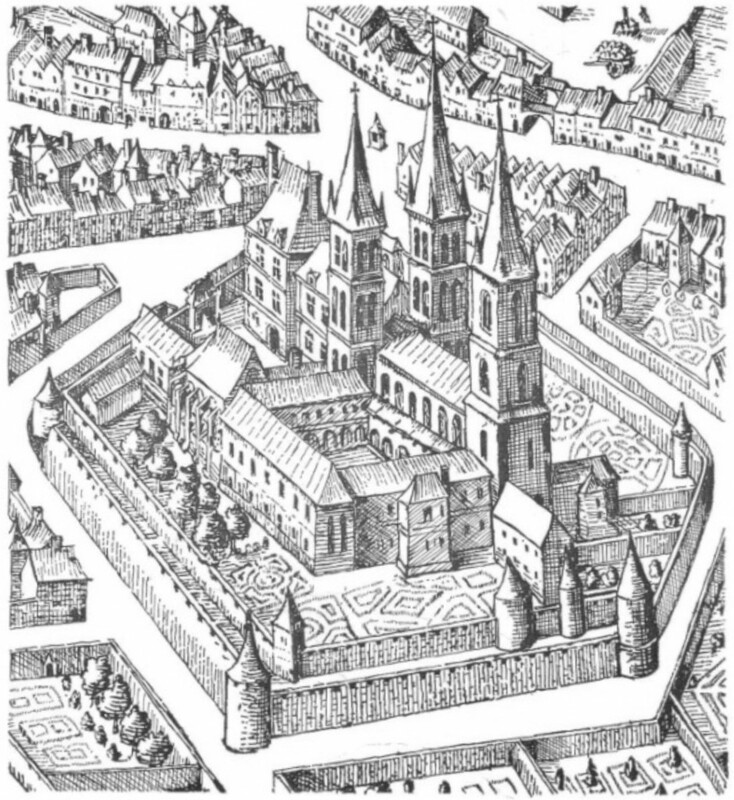 Indeed, Mary Carruthers has shown that the sophisticated memory technologies of the Middle Ages relied extensively on people’s recall of particular pages and how they were laid out. 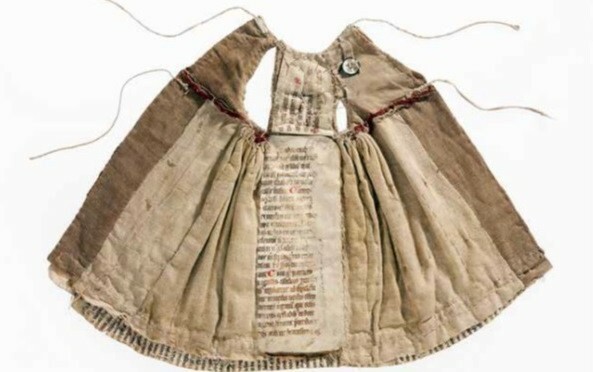 Medieval people understood their books and pages to be material, not just in the sense of being tangible, but also of previously having had different raw states, states which suggested a cluster of metaphors for the acts of writing and reading. In contrast today we don’t tend to think much about the wood pulp or computer codes that have made up our ‘books’, and those raw materials figure very little in the metaphorical planes of their contents. I wonder what those contents would look like and what effect they might have on us as readers if they did? 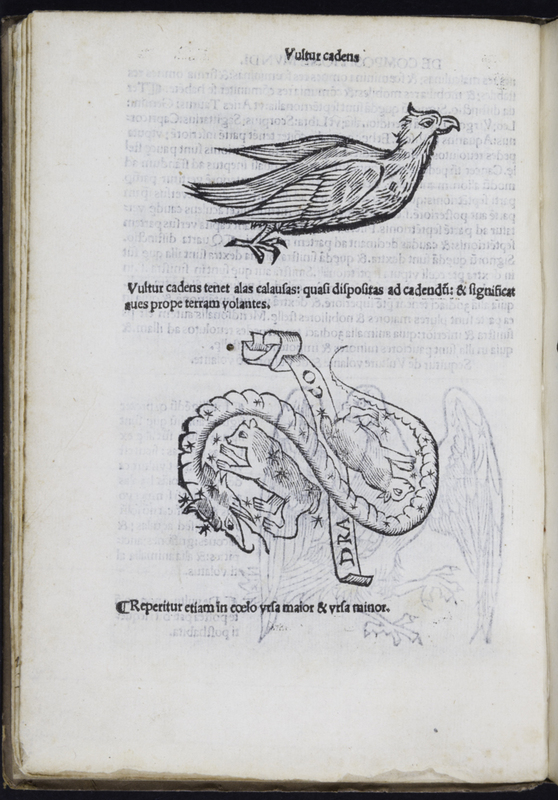 For a longer discussion of these ideas and a fuller bibliography, see Isabel Davis, ‘Cutaneous Time in the Late Medieval Literary Imagination’, in Katie L. Walter ed., Reading Skin in Medieval Literature and Culture. Birkbeck College is running evening tuition in masters-level modules which will be open to all students with a good undergraduate subject in a related discipline. 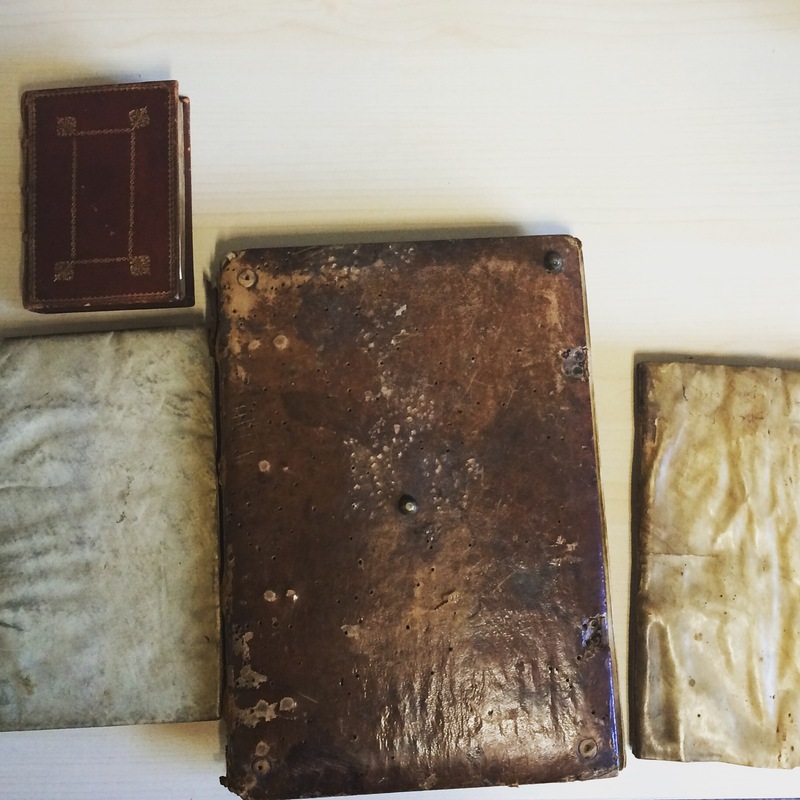 In October 2014 we will be offering a 9 week module (one evening a week) on ‘Medieval Text and Intertext’ and in October 2015, a module on ‘Medieval Material Texts’. 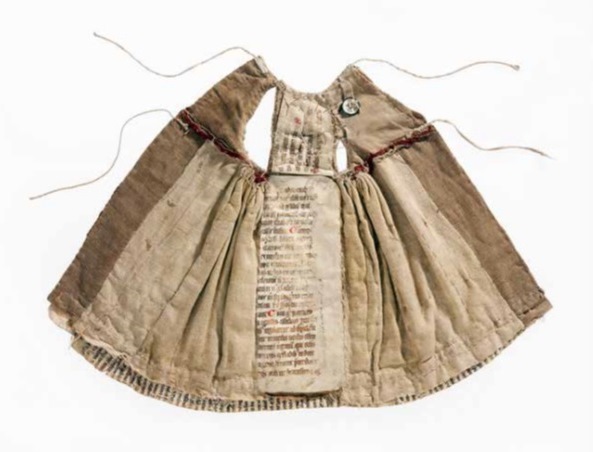 Medieval Text and Intertext will consider medieval texts in their interdisciplinary contexts. 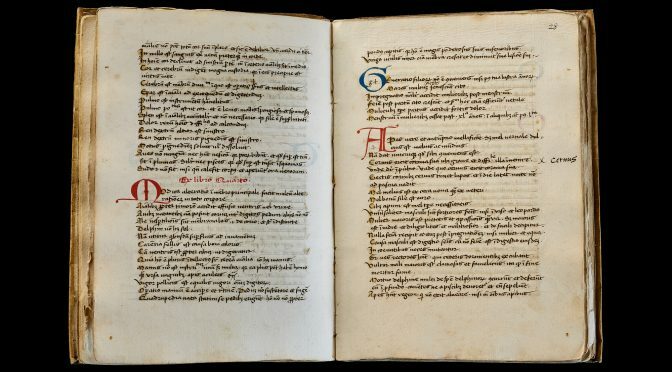 Students will look at issues of genre, form and literary theory in the texts of a manuscript age. 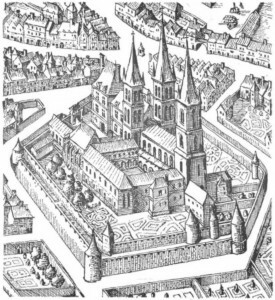 The course will be taught through case studies, investigating some of the most spectacular works of the English Middle Ages. 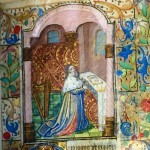 Medieval Material Texts considers medieval manuscripts in their literary contexts. 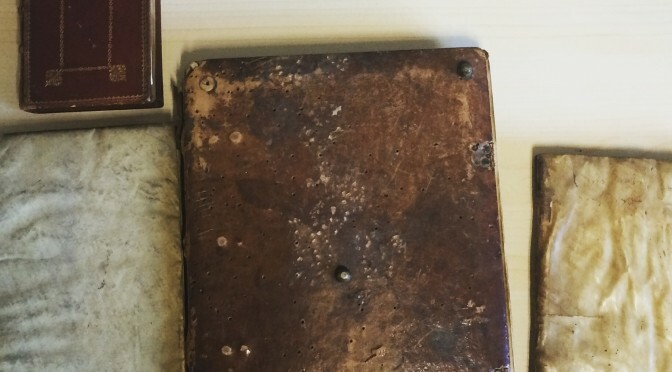 Focusing particularly on English medieval texts, this course considers the relationships between the physical format of manuscripts and their curious contents. At the end of each course students will have the opportunity to write an independent research essay under academic supervision. Birkbeck is a great place to come and try out material text or medieval studies. We are located in the midst of some of the best research libraries and resources in the world. 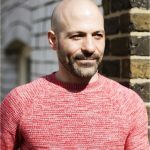 We have research-active staff with leading publication profiles. There are lots of other optional interesting events in which to take part. For more information about this course contact: Dr Isabel Davis (i.davis@bbk.ac.uk).